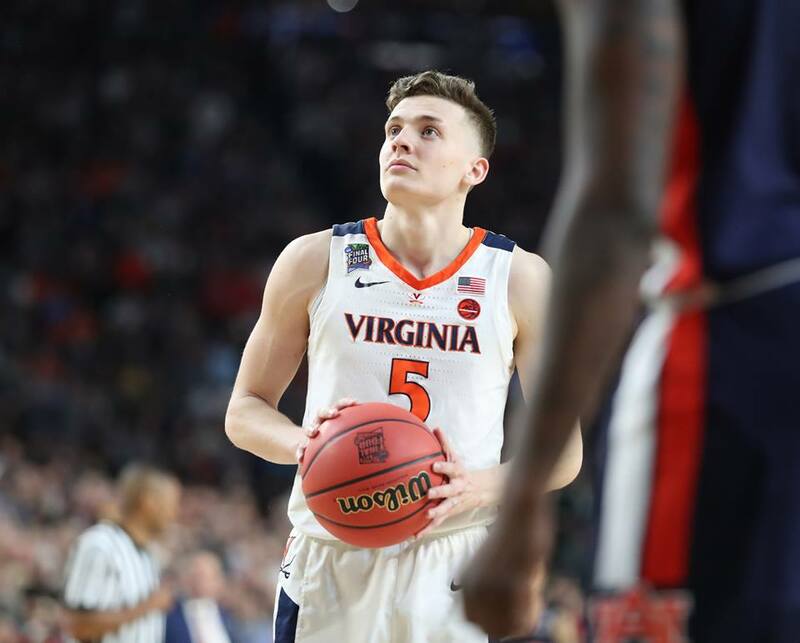 MINNEAPOLIS – Kyle Guy generally avoided anyone on the Virginia sidelines while the officials checked the clock. He knew that three critical free throws awaited him with his team down by two. At the Final Four. In front of 72,711 fans. Guy did, however, scan the Virginia fan section for a friendly face. And with that, Guy calmly walked out on the U.S. Bank Stadium floor and made all three free throws to push UVA past Auburn, 63-62, and into the program’s first National Championship Game. He looked stone faced and confident on all three shots, even after Auburn called a timeout between the final two attempts to try to break his rhythm and concentration with hopes of overtime. As much confidence as Guy had in himself in that situation, his teammates and coaches matched it. They left him alone on the sidelines in order to let him focus, but they also knew he didn’t really need a pep talk at that moment. “Once I heard that whistle and they reviewed and Kyle was shooting three free throws, I was pretty darn confident,” UVA’s Ty Jerome said. Like many players, Guy had lived that moment many times on courts far away from the Final Four. He’d imagined game-winning moments and incredible shots with him in the spotlight before and now the moment had arrived. He retreated to his own mind at U.S. Bank Stadium too. How Guy ended up in that situation came from Virginia’s usual arsenal. With an inbounds play coming on the left side, the Cavaliers turned to an inbounds play they have used throughout Tony Bennett’s tenure, including as recently as the Elite Eight game with Purdue. The play includes a look with Guy peeling back toward the ball side corner for a catch-and-shoot opportunity. While there are other options on that play, Hunter and Mamadi Diakite joked after the game that the play is called “Kyle get open.” Jerome said he knew in the back of his mind that Guy was going to be one that came open to get the ball. Guy made sure he was behind the line on the catch and rose without hesitation when Samir Doughty tried to crowd his space. Doughty’s momentum in chasing Guy, however, carried him forward and he made contact below the waist as Guy released the ball. There was no delay from the baseline official, who immediately raised his hand to signal the foul call. On the other end of the stadium, Auburn’s fans reacted with such noise that not everyone in the building knew a foul had been called, but UVA’s players said they heard the whistle and knew that Guy would be going to the free throw line. Guy felt like he didn’t have space to land and immediately turned his focus to the free throw line once he heard the sound of the whistle. Well, more than one actually. Virginia trailed by four points at 61-57 with 17.6 remaining when it looked to Guy the first time in the final seconds. He came off a screen toward the opposite corner, hesitated briefly to gather himself, and let a 3-pointer fly that cut the lead to one with 6.5 seconds to go. Prior to the three free throws and that made 3-pointer, Guy had made just 4 of 10 shots and 1 of 5 3-pointers. Still, everything that happened before those final moments steeled Guy’s nerves. A little more than a year before, of course, UVA’s season ended in historic fashion when the Cavaliers became the first No. 1 seed to lose to a No. 16 seed. On that night, Guy hunched over with his hands on his knees and started crying as UMBC players celebrated wildly around him in Charlotte. Photographers captured that moment with Guy in despair and the Retrievers leaping with joy in the background. He made it the background on his phone and his Twitter avatar. He taped it up in his room. Guy battled anxiety and said he had to live through death threats and hate mail. He eventually made that struggle public with a pair of Facebook posts and a lengthy article with SB Nation. All of that led Guy through this season and to that free throw line in Minneapolis. 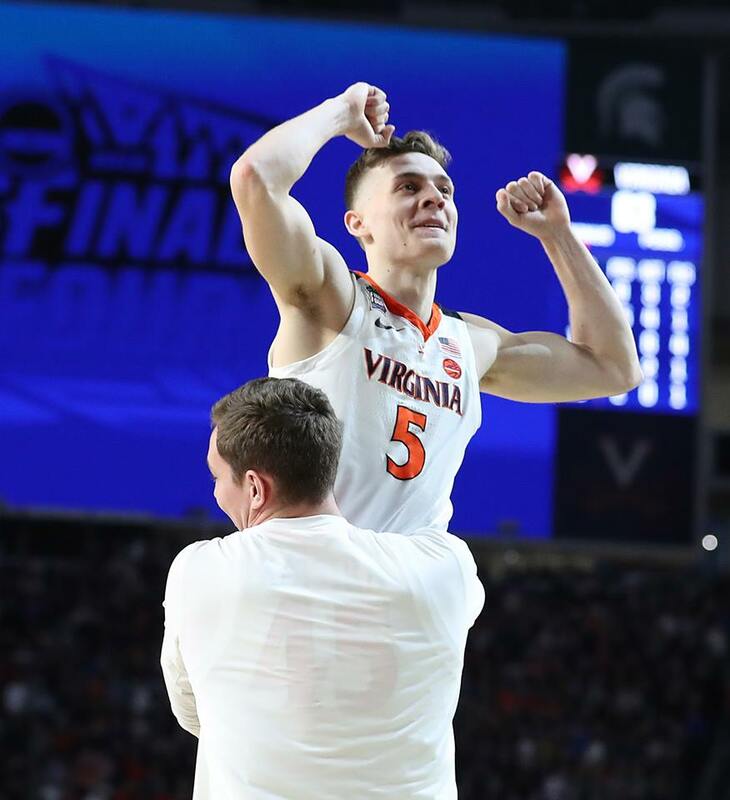 Afterward, after he had made those free throws and soaked in the moment with his teammates and Wahoo fans, he still couldn’t put it into words what had happened or really how it felt. An understated Congrats! Go ‘Hoos!